Celebrate Australia Day with some uniquely Aussie ‘Roo’ meat! Tomorrow, on January 26th, our beautiful country turns the ripe old age of 222! For my international readers who aren’t sure what Australia Day is, let me quickly explain. Australia Day is a national public holiday to celebrate the First Landing in 1788 when Captain Arthur Phillip commandeered the First Fleet of eleven convict ships from Great Britain. It’s also known as ‘Invasion Day’ because many native Aborigines were killed by the British arrivals. If you look up official Australia Day history websites, there’s a distinct lack of information about that brutality. Australians love to celebrate with a BBQ at home, the beach or a park. Remember, it’s Summer time here Down Under! The best part is that we get a day off work. There’s nothing more Aussie than kangaroos (except maybe koalas!) and kangaroo meat is one of the leanest and protein-rich meats available. It’s super juicy if you don’t overcook it and it’s really cheap to buy in Oz. I’ve made these even more ‘Aussie’ by using green and yellow capsicums (peppers). Sorry to my Northern Hemisphere friends who are braving the thick snow! You can make these in a frying pan or skillet if there’s kangaroo meat available in your neighbourhood supermarket. On an unrelated note, while searching for 222 historical things, I came across this very freaky website that thinks the number 222 is very superstitious. You be the judge. Click here to take a look. 1. Soak the bamboo skewers in cold water for at least 30 minutes to prevent them from burning. 2. Slice the kangaroo loin and both capsicums into 3cm cubes and place in separate bowls. Thread the capsicum and kangaroo meat alternately onto the skewers. 3. Heat the BBQ or a large frying pan. 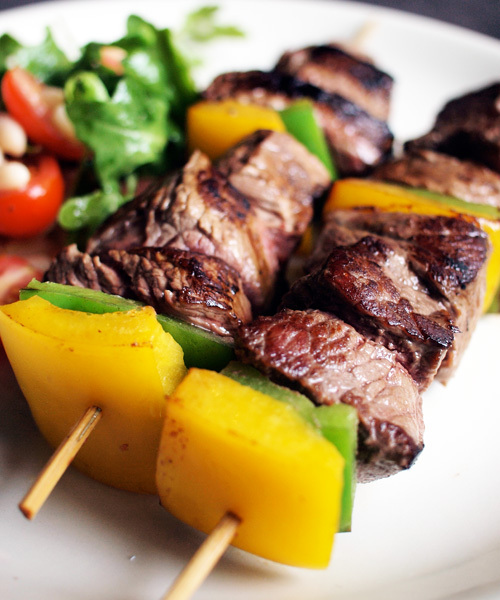 Brush the skewers with vegetable oil and season generously on both sides with salt and pepper. 4. Cook for 8-12 minutes, turning frequently until medium rare or to your liking. Allow to rest for 5 minutes then serve with salad and lemon wedges. I love it! I usually make “skippy burgers” (kangaroo burgers with a blueberry & black pepper sauce) for Australia day but I might give these a crack. They certainly look the part. Clever to use green and gold capsicums to make this really “true blue”…so many colours!..LOL! I’m glad Skippy is being featured more and more on our dinner tables. There is no added flavor to this meat. I bet the real meat taste is the star here!!! I guess green and gold fits with wattle as the floral emblem, but I can’t explain why NZ are the all blacks. Maybe sports colours just can’t be explained logically. I normally give kangaroo meat to my cats ;) but I *did* eat it on a pizza once! Mmm those look perfectly cooked. I’ve always thought of roo meat as a bit of a novelty, but your photo kind of makes me want to go out and find some. Thank you for visiting my blog! This post reminded me of a question I wanted to ask Lorraine but I never got around to – have you eaten Kangaroo meat. What does it taste like? Is it unique or does it have a similar taste to more common proteins? Sorry for the late replies guys! @Shannon – I love the idea of a blueberry sauce with kangaroo, the sweetness would be perfect with the slight gamey-taste of the roo! @Y – I hope you did! I haven’t tried roo snags, yum! @Peter – True Blue! That’s a phrase I left out, thanks for the reminder. @Nina – Exactly! They are great marinated, but I wanted the meat to be the star of these ones. It’s a really delicious taste. @Lorraine – Thank you! I love your lamington tiramisu, so creative. @Diva – I hope you get to taste it! It’s really yummy. @Laura – Oh dear! Do they like it? I’ve never heard of it on a pizza! Although it’s super juicy when marinated in strips and stir fried. @Belle – Thanks! I loved your surf and turf skewers, just wonderful. @Marc – Do it! As an experimental cook it’s crazy you haven’t tried it yet. I think you’ll like it. @Sean – No problem! It’s a cross between beef and venison, in my opinion. It’s a little gamey, but not too much and soaks up the flavours of marinades really well, especially spicy ones. Hope that helps! I’m dryin to taste Kangaroo meat ! The skewers looks so succulent n delcious. Wow, Christie, that’s a new one for me! I did not know kangaroo meat was still eaten I assumed it was on the endangered species or something! That meat just looks so delicious, I wish I could put my hand through the monitor to try it! Try cat instead of cangaroo, its meat is more tender but marinate it the day before. In Poland (Europe) we see Kangaroos only in ZOO. I need to hunt one ;). Or a small trip to Australia. Love to taste such an exotic meat. It’s look delicious.